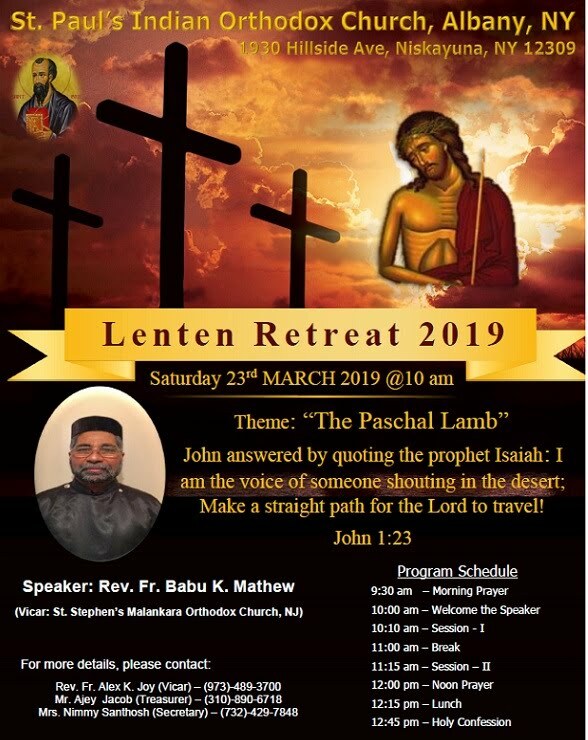 Our Lenten Retreat is scheduled on March 23rd 2019 from 9.30 am until 2 pm. This year’s retreat speaker is Rev. Fr. 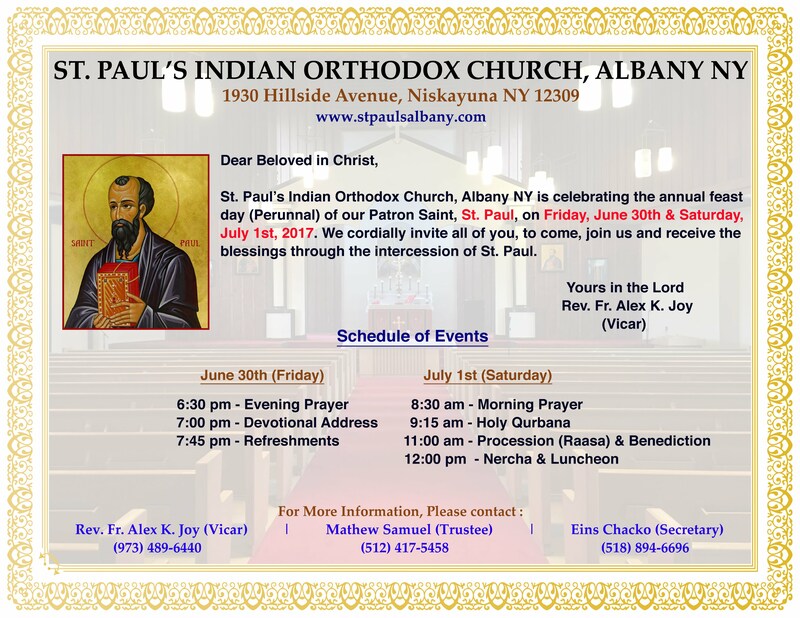 Babu K. Mathew, vicar of St. Stephen’s Malankara Orthodox Church, Midland Park, NJ and the theme is “The Paschal Lamb”. Please see the attached flyer. St. Paul's Albany Sunday Schools kids participated in the "Thanksgiving Feast for $2.17" charity program organized by Capital City Rescue Mission. Our kids raised $200 and donated to this Charity program and for every $2.17 donation, the Rescue mission provide a Thanksgiving meal and much needed hope to the hungry homeless neighbors in Albany. Capital City Rescue Mission is a non-profit charity organization located in Albany downtown, which supports hundreds of homeless people every year by giving Clothing, shelter, food, medical help etc. in and around Albany city area. As part of this program, every year Capital City Rescue Mission will provide Thanksgiving meals for all the homeless and needy people around our community which includes men, women, and children. The clergy and faithful of the Northeast American Diocese, offer our prayers and love to our Metropolitan, His Grace Zachariah Mar Nicholovos, as His Grace celebrates the 25th anniversary of his consecration as a Metropolitan of the Holy Orthodox Church. May God continue to shower His wisdom, strength, and blessings upon our Thirumeni, as he continues to shepherd our Diocese. 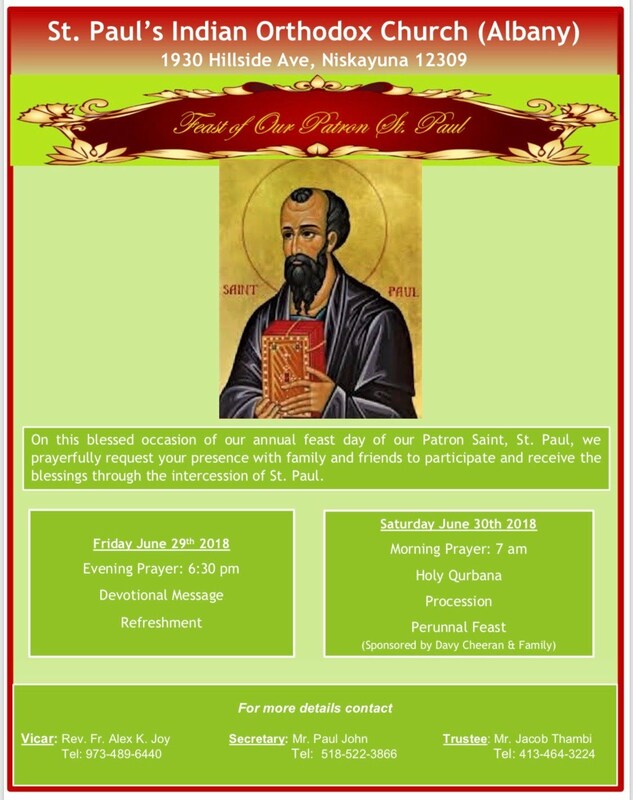 To mark this special occasion, our Diocese will be hosting a formal banquet in honor our beloved Metropolitan on the evening of Sunday, August 26, 2018 at The Green Tree Country Club, located at 538 Davenport Avenue, New Rochelle, NY 10805. 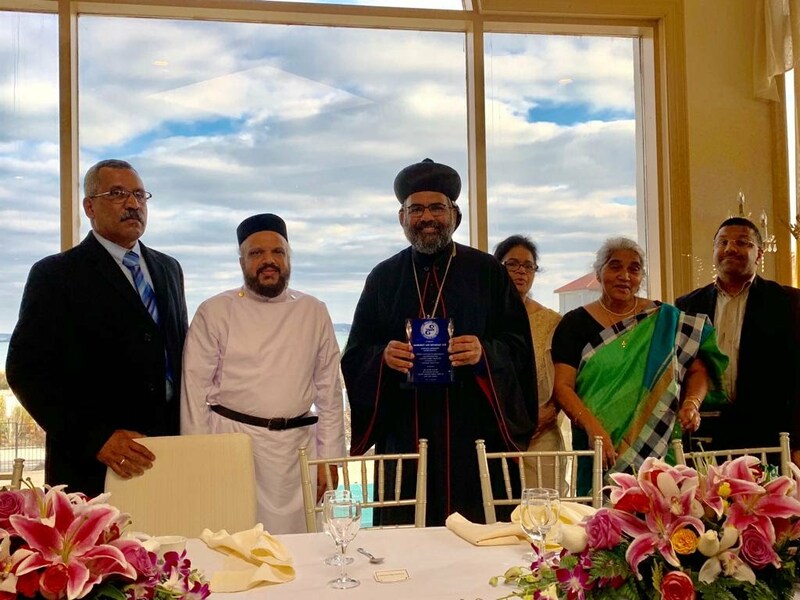 Congratulations to the St. Paul’s Indian Orthodox Church team who won the first place in the Silver Jubilee Bible Quiz conducted by United Christian Church Albany on Saturday November 3rd, 2018. This is a historic victory for our church team and a demonstration of our Orthodox Church’s faith and emphasis to train and study the Holy Bible to glorify God.